To come back to the discussion about the identity of the architecture profession I have here a publication that explores this question from a different direction. 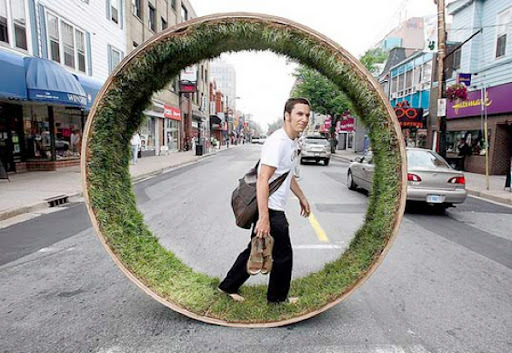 What if architects make something else, what if they work in the field of art and produce installations? Are they still architects, and if so what does it mean for the identity of the professions, both of the artists and the architects? Installations by Architects – Experiments in Building and Design by Sarah Bonnemaison and Ronit Eisenbach (2009) is published by Princeton Architectural Press. The book identifies a “rich and increasingly diverse practice” that emerged over the past few decades in art practice, the working with installation and architects are amongst the user of this type of expression. It seems to be the ideal playground for architects, the installation implies a direct spatial component and the profession identifies it self with spatial practice. Architects as artists have a long tradition. More often than I feel comfortable with, the architect is stereotyped an artist, a practitioner capable of doing art work or at least someone with an ‘arty’ flair. In most cases architects enjoy playing in this mist of uncertainties and enjoy the opportunities and in some cases reduced responsibility. This has over the years, however, created a watered self image and architecture today can be anthropology, sociology, engineering, planning, construction, sustainability, geography, politics, management, art, archeology, research, business, fashion, theatre, just to name a few. This can be confusing, if the standard idea is the planning and construction of a house. However there is noting wring with this practice in principle and as art of the Bauhaus movement, architecture was part of an idea of space, together with other disciplines, including the arts, that had the boundaries blurred explicitly with the idea to foster collaboration between the different disciplines. Today it seems almost as if the architects still follow this idea, but as the only discipline ending up isolated and with a fading identity. It is probably more about the attitude, not about the practice. Image by Andre Forget taken from we-make-money-not-art / Asher DeGroot, David Gallaugher, Kevin James, and Jacob Jebailey, Walking in the Park. And this is exactly what this publication manage to demonstrate. The projects, better installations illustrated and documented in the book are all, without exception extremely ‘good practice’, whether artist, architect, sociologist, or community worker. The really new aspect highlighted in the book is the use and benefit of this practice for educational purposes. But yes it is obvious, not in this book but leading schools such as the Bartlett school of Architecture make a lot of use of these techniques. In the introduction the authors take the readers through a chain of historic examples of installations that you might be familiar with. For example Kurt Schwitters, Merzbau or Gordon Matta-Clark’s Splitting or Christo and Jeanne-Claude’s work The Gates. For the book the selected projects are grouped into five thematic topics: tectonics, body, nature, memory and public space. This list seems a bit general at first, but makes perfect sense in the context of the projects. The representation of the projects happens in two parts. Part one is a text based description of the work, the context, comments and critique, whereas the second part is a visual, mainly photographs based documentation with short explanation texts, mainly explaining the content of each illustration. The two parts are spatially separated. So you get these blocks of texts, some five projects, followed by a block of visual documentation. This is confusing at first but again falls in to place later on. It opens up possibilities to cross read projects, widen the contexts and link practices. Documented work’s include Diller + Scofidio (1993), Bad Press, Dissident Ironing; Pilip Beesley (1998-2007), Geotextiles; Marco Casagrande and Sami Rintala (1999), Land(e)scape; fieldoffice (2001), NY A/V or the pixualisation of facades by LAb[au] (2007), touch. The presented work is extremely evocative and of the type, why didn’t I have this idea? I could have done this! in very positive sense here. I believe this is not only the case for the audience, but very much for the installation practitioner himself and this is most likely the reason behind why architects are so much into this kind of practice. Their other work is actually benefitting from these ‘research’ practices. 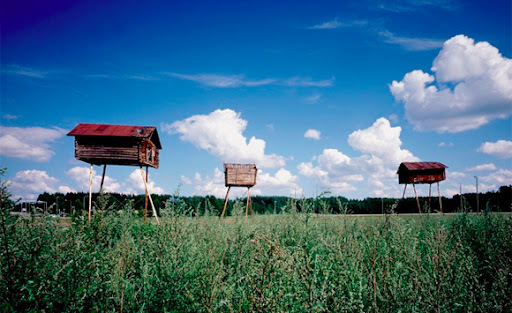 Image taken from archiworld / land(e)scape (Savonlinna, Finland – 1999 – Recalling the little barns that pepper the traditional Finnish landscape, the architectural installation is designed as a protest against the desertification of the countryside. Three of these abandoned barns have broken free from their moorings to rise majestically 10 meters from the ground. Bonnemaison, S. & Eisenbach, R., 2009. Installations by Architects: Experiments in Building and Design, Princeton Architectural Press.